Thanks to Pain Exhitib.org, the painting, Honesty & Hope (a.k.a. 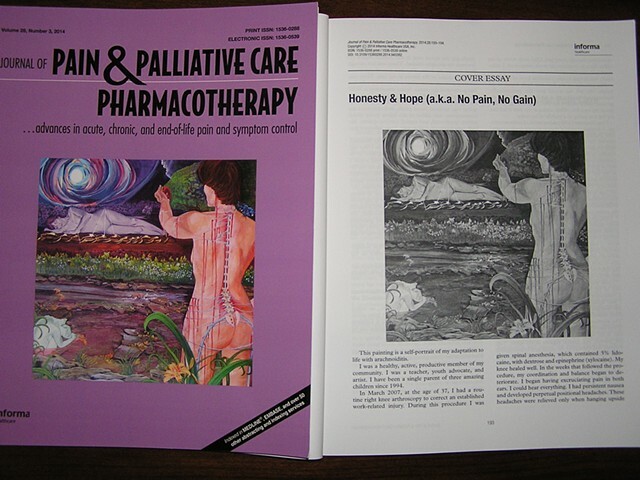 No Pain, No Gain) is featured as the Cover (with Sheila's original Essay p. 194) in Volume 28 Number 3, 2014 of The Journal of Pain & Palliative Care Pharmacotherapy ...advances in acute, chronic, and end-of-life pain and symptom control. This essay and painting are shared with the public to increase Arachnoiditis Awareness and Prevention Efforts.